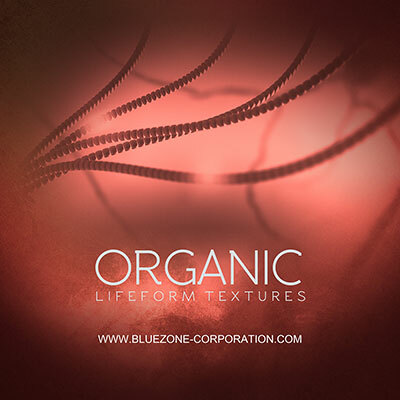 'Organic Lifeform Textures' by Bluezone Corporation is an inspirational sound effect library offering a selection of 99 ( 24 bit / 96 kHz / stereo ) unusual and mysterious sounds : From huge organisms to tiny insects, unexpected groans to invertebrate creatures moving through mud, this SFX library will offer you ultra high quality malleable textures for all your projects. This downloadable sample pack is very usefull for pro editors, film makers, music producers and video game sound designers. All sounds were recorded using various sources and processed meticulously using high-end gear. These organic sound effects have been layered to give you ready-to-use elements. You can easily pitch, modulate, mangle and stretch these sounds to create thousands of variations. 'Organic Lifeform Textures' has been designed to enhance science fiction, mystery, suspense and fantasy video game and scoring projects. Note: The background ambience in the demo is not part of the product but is added free of charge.